Despite its failure to unseat King James II, the Monmouth Rebellion had a profound influence upon English politics. In particular, it reignited the debate about whether the country should rely on a professional army under direct royal control or local country militias made up of part-time soldiers. King James favoured the former, and used criticism of the militia’s performance during the rebellion to support his argument. Contemporary commentators and historians alike all certainly seemed to agree that the king’s victory was won in spite of - not because of - the militia. But is this a fair judgement? 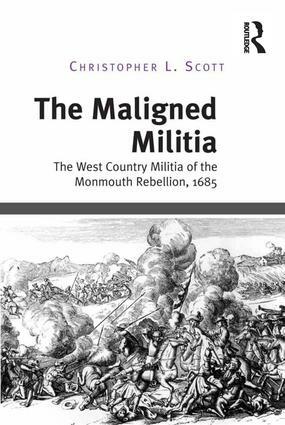 Drawing upon a wealth of information gathered from personal accounts, private papers, letters, financial records, diaries and memoirs, this book revisits the events of 1685 to assess the militia’s performance in helping to defeat the so-called ’pitchfork rebellion’. Through an extensive investigation into the militia itself, its social composition, role, training, armament and leadership the study sets a benchmark for what could have been realistically expected of these part-time soldiers, and then sets this against the actual tasks that were asked of it in 1685. The results that emerge from this exercise paint a very different picture of the militia’s role in the rebellion than has hitherto been accepted by historians. Judged by these criteria, a convincing case is made that the militia was in fact an efficient military organisation according to contemporary expectations and demands made of it. Criticisms of it, it is argued, stem more from political expediency than impartial judgment. As well as being of interest to military and social historians, this book demonstrates the dangers to all historians of taking at face value contemporary comments. It shows how subtle and interlocking forces, that may at first glance appear unrelated, can work together to colour opinions of events and organisations. Preface; Introduction; Military effectiveness; Background; Organisation and strength; Coming into operation; Fit for service; Appearance and bearing; Performance; Expectations and loyalty; Conclusion; Appendices; Bibliography; Index. Dr. Christopher L. Scott has been walking battlefields for over 30 years, analysing ground and tactics. He has taken numerous groups of enthusiasts around the battlefields of Britain, and three continents and in 2002 co-founded the International Guild of Battlefield Guides. Chris has lectured for the British Councils Organisation, was part of a British delegation to the Zulu War Centennial Ceremony and represented Great Britain at an International Congress of Historical Sciences. He has also lectured for the British Commission for Military History, The Historical Association and The Battlefields Trust for whom he is a Trustee. He is also a member of the Royal Historical Society, and gained his PhD in seventeenth-century military history at Cranfield University under Professor Richard Holmes.